The Association hosted a tour this past week for Assemblyman Devon Mathis of the 26th Assembly District. The Assemblyman represents Inyo County and large parts of Tulare and Kern Counties, including the cities of Bakersfield, Delano, Dinuba, Hanford, Lindsay, Tulare, Porterville and Visalia. On this trip, the Assemblyman visited a cotton field, and cotton gin with Association Board Member Stan Creelman, of Mid Valley Cotton Growers, and met with Growers Association Chairman Steve Wilbur at his cotton field southwest of Tulare. 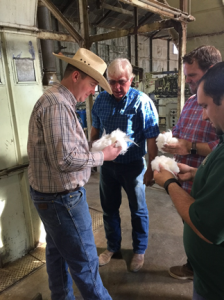 Water and regulatory impacts were among the topics covered and the Assembly even had an opportunity to ride in the cotton picker. Assemblyman Mathis is the Vice chairman of the Veterans Affairs Committee and also sits on the Agriculture, Aging and Long Term Care, and Water, Parks and Wildlife Committees. Accompanying the Assemblyman on the tour were the Association’s President/CEO Roger Isom. This entry was posted in NEWS & ISSUES on October 23, 2015 by ccgga.